San Jose Councilman Xavier Campos is under investigation by the FPPC for how he managed his 2010 campaign. 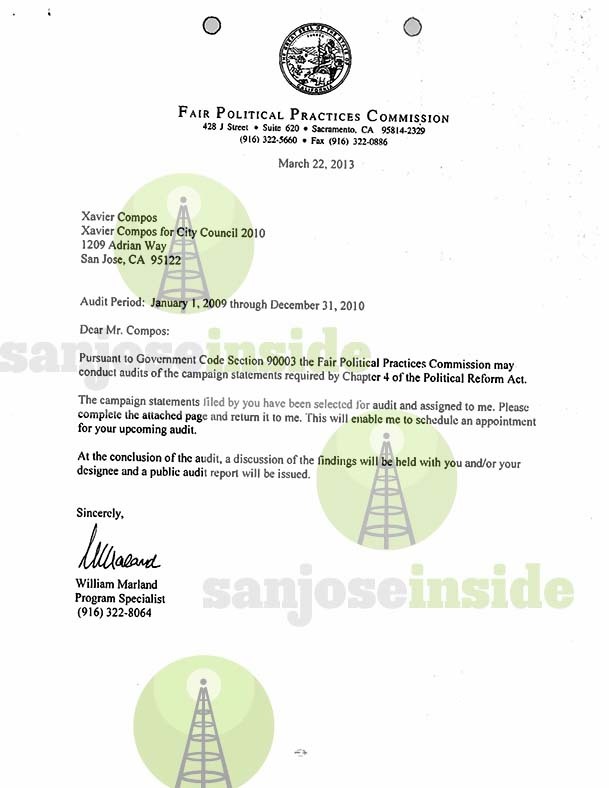 The Fair Political Practice Commission (FPPC) confirmed Friday that it has launched an investigation into San Jose Councilman Xavier Campos. Gary Winuk, chief of the FPPC’s enforcement division, says that his office began looking into Campos’ 2010 City Council campaign after San Jose Inside reported that the councilman used the same campaign treasurer, Linda Delgado, as former county Supervisor George Shirakawa Jr. A letter was sent to Campos in March informing him of the investigation. Shirakawa pleaded guilty March 1 to five felonies and seven misdemeanors related to his misuse of public funds and campaign contributions. Delgado, the mother of one of Shirakawa’s children, served as an absentee treasurer in his 2008 and 2012 supervisor races, which allowed Shirakawa to funnel more than $100,000 in and out of campaign accounts. Shirakawa repeatedly lied on his campaign forms—when he was actually filing them—and even set up a secret bank account. He has blamed a gambling addiction for his illegal activity. Campos has declined San Jose Inside’s repeated interview requests to discuss what work Delgado did for him as his campaign treasurer. At first glance, however, it appears she did little more than collect a paycheck and sign a few forms. The councilman should have closed out his campaign account six months after the November 2010 election, according to city rules. However, Campos waited until last October to forgive nearly $10,000 in debt, have himself installed as treasurer and abruptly close the account. All of this occurred while San Jose Inside was investigating Shirakawa, Campos’ close friend. Before running for the District 5 council seat, Campos worked as a policy aide in Shirakawa’s supervisor office. This is not the first time Campos has been under investigation for his potential involvement in a misuse of funds. Ultimately, the District Attorney’s office decided not to charge Campos in the $1 million theft of teacher and employee pension funds from charter schools run by the Mexican American Community Service Agency (MACSA). Campos served as the nonprofit agency’s chief operating officer (COO) at the time, and many employees still suspect he knew the top officials in the organization were illegally diverting funds. Here is the FPPC letter sent to Xavier Camps informing him that his 2010 City Council campaign forms will be audited. What does machine boss Cindy Chavez have to say about this? She was a close ally of the indicted Ron Gonzales, the convicted Terry Gregory, the convicted George Shirakawa Jr. and the soon to go down Xavier Campos. Will voters connect the dots? Lily like your passion but time to redirect your anger / energy to Chuck and his clowns and why they have decided to turn this once great city into another Oakland. And don’t tell me this is a pension issue, the spending and lack of judgement is what is killing this city. And with no visioning sight, we will never recover. How about looking into all the back room deals and hand shake deals that never get deceased. How about all the idiots (Chuck and his clowns) that sit on the rules committee. How nothing gets done that is not approved by this group. How about Chuck refuses to negotiate with the unions, knowing at the most they can get a 1% raise by going to arbitration. How about how is is taking it to employees already retired and have no recourse. Lily, Do you not get it 90% of all elected people can’t give a damn about you from city to federal levels. It is all about them and their friends. Why do you think the president just came here on Air 1 to raise money on your dime to the tune of over 2 million dollars to raise 1 million for his party in a non election year. Not bad for a 2 day stay. Lily you are right on target because there is a bigger element working to force these subpar but easily manipulated unqualified candidates down the public’s throat. Campos and his sister are prime examples of this. Very unqualified but easily manipulated. Xavier Campos and his I didn’t know nothing and was unaware routine gets old. If he is truly as clueless as he claims whenever something goes wrong right under his nose when it is his job to know what is going on why does he think the public should support him? He should save the public the extra expense of yet another investigation and trail and resign. He is a disgrace who has accomplished NOTHING during his two years in office (nothing except shameful affiliations and dozens of “no comment” avoidance of public scrutiny) Shame on you Xavier, face it, you’re no better than your best bud and free lunch partner Shirakawa.